Above - The Site of the former Borough / Feldman's / Queen's Theatre, Blackpool in September 2016 - Courtesy Alfred Mason. 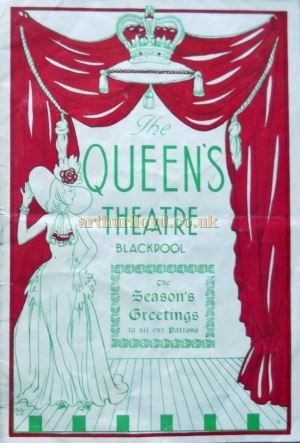 The Queen's Theatre, Blackpool had a long and involved history. The Theatre originally opened as the Borough Theatre on the 3rd of September 1877 with a production by the London Opera and Burlesque Company. It's manager was H. A. Hall. 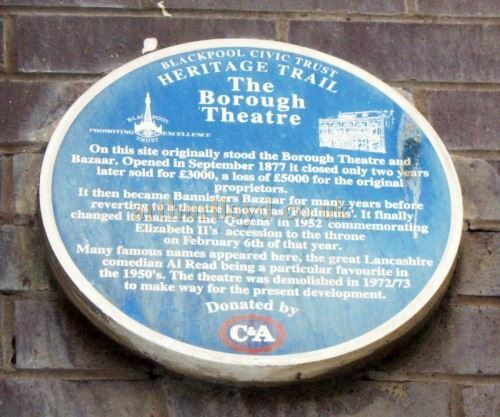 Right - A Plaque, situated on the facade of the building which today stands on the site of the former Borough Theatre, Blackpool - Courtesy Alfred Mason. The ERA carried a notice about the opening of the Borough Theatre in their 2nd of September 1877 edition which seems to show that although the new Theatre was about to open it was having trouble finding shows to put in it, they said: - 'This elegant New theatre, which is being opened on the 3rd September by the London Opera and Burlesque Company, is TO LET for the week commencing 10th September. It is centrally situated, and will seat about 800 persons. The Stage is 30ft. wide by 22ft. deep; Proscenium opening, 21ft. wide by 17ft. high. For other vacant dates and particulars apply to H. A. Hall. Talbot Square, Blackpool.' - The ERA, 2nd September 1877. The Borough Theatre had a very short life as it closed only two years after opening, when it was sold for £3,000, a loss of £5,000 for its original proprietors. 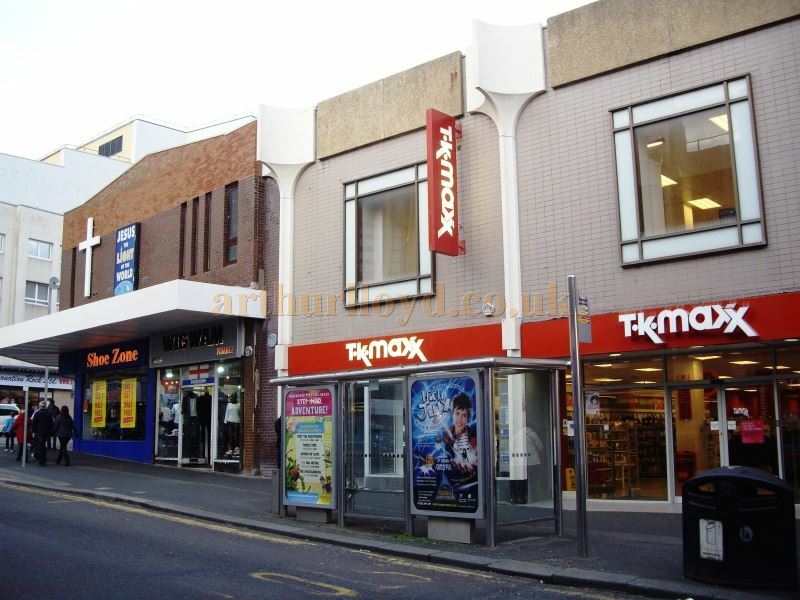 The Theatre was then renamed Bannisters Bazaar and ran as such for many years until it was eventually renamed Feldman's Theatre in the 1920s. As Feldman's it was run as a number two touring House with a diet of variety and touring revues. It was intimate, on two levels, and seated around 1,000. At the rear of the stalls behind the pit was a little raised balcony where the cheapest but best seats in the house were. 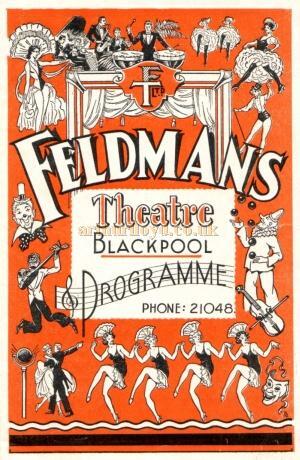 Right - A 1950s programme cover for Feldman's Theatre, Blackpool - Click to see details of four programmes from this era. 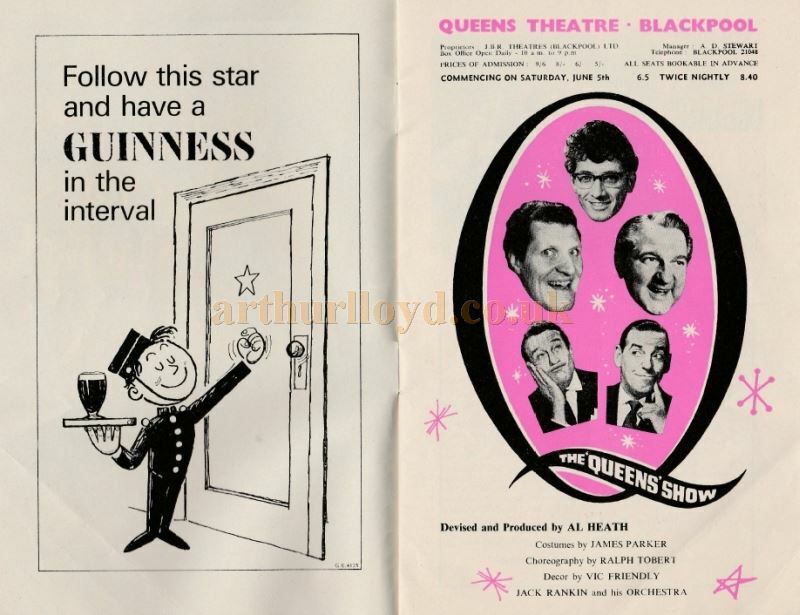 Jimmy Brennan bought Feldman's Theatre in late 1951 and reopened it in 1952 as the Queen's Theatre with a spectacular summer revue titled 'Singing in the Reign' starring Josef Locke and Nat Jackley. Blackpool was in the boom time after the war years and the visitor's appetite for variety and spectacular revue was insatiable. He wisely decided to put on a top notch summer show each year for 16 weeks and to play out the rest of the year with touring revues variety and pantomime. Jimmy was in every respect a self made man. He originated from Barrow in Furness and was originally a scrap metal merchant. He bought a battle ship off the navy when the first world war ended that was sunk in Barrow harbour for twopence and salvaged it, and that set Jimmy on the road to becoming a millionaire. 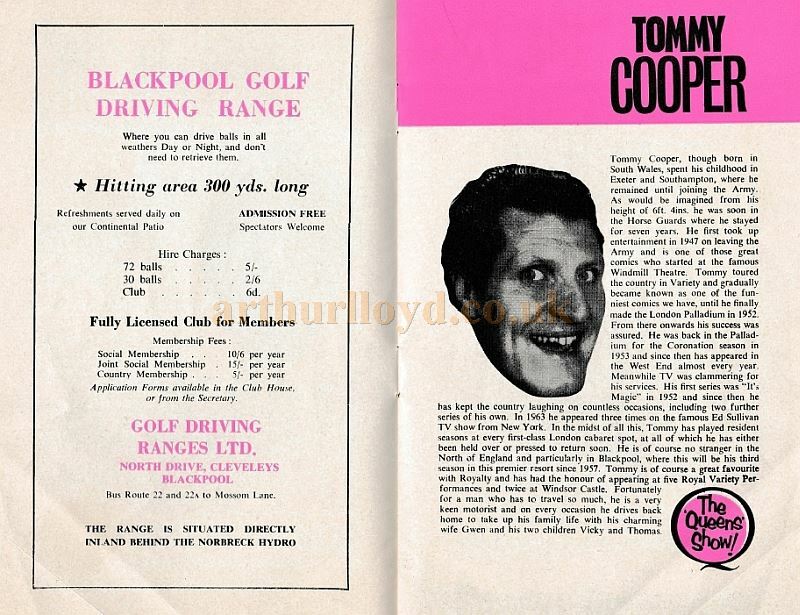 By 1951 he was one of the richest men in the area and lived in St Annes. 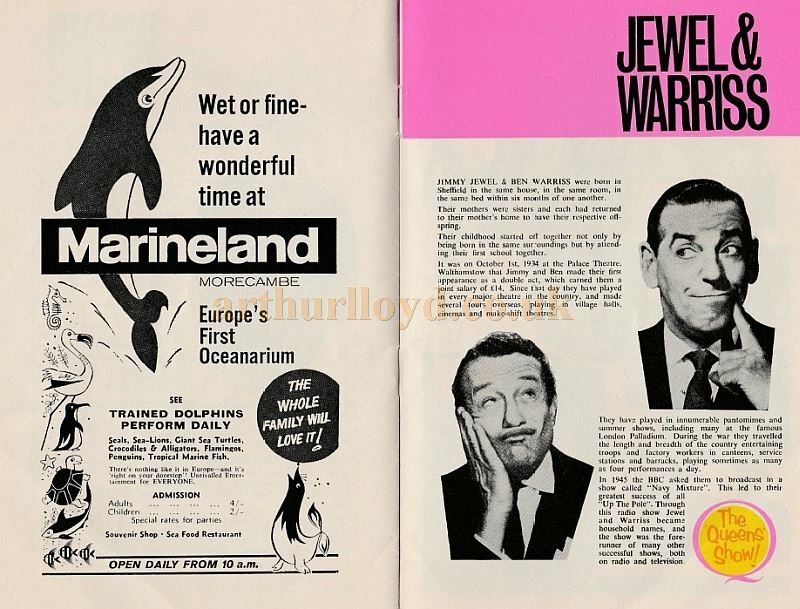 He also owned a chain of around twenty Cinemas, and the Hippodrome Wigan, The Pavilion Liverpool, and the Hulme Hippodrome Manchester were his other Theatres. He did not hire shows on a percentage of the box office but paid them a salary because business was good at all his Theatres in those days. He also strengthened the show by adding a name to the top of the bill to ensure quality. He was notoriously mean, so much so that it caused great amusement, and he cultivated this image. He was very tall, wore a dark suit, always with a sombre tie with a gold pin, and homburg hat which he rarely took off. 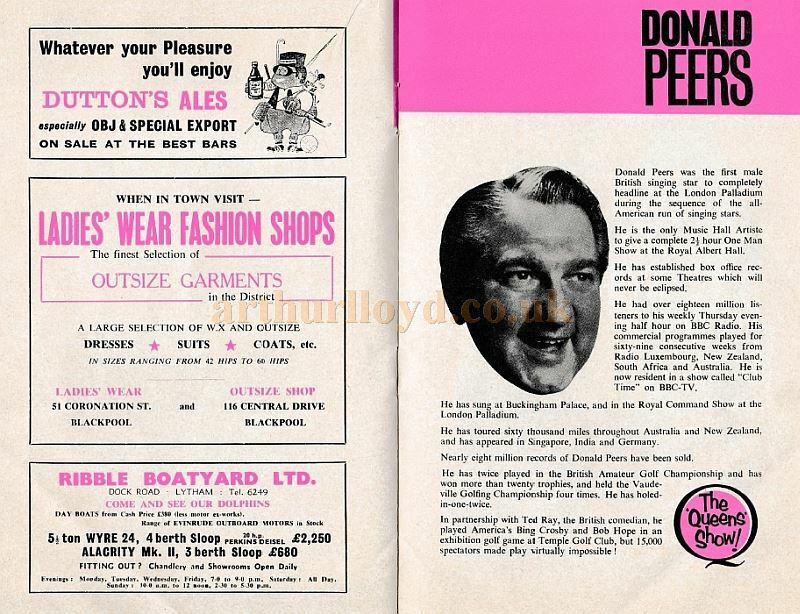 He ran his empire from offices in the Deansgate Cinema in Manchester which he owned and was there around four days a week. Jimmy spent the rest of his time in Blackpool. He hired Alec Shanks the West End director and costume designer to produce the first summer show. Right - A photograph of Ted Foreshaw in the prompt corner of the Queen's Theatre, Blackpool - Courtesy Dawn Hughes, whose grandmother Mrs. Edwards' second husband was Ted Foreshaw. Jimmy put in his own manager Ted Foreshaw when he took over the Theatre. Jimmy would then say good night and go into his home to bed leaving poor old Ted to find his own way back to Blackpool. 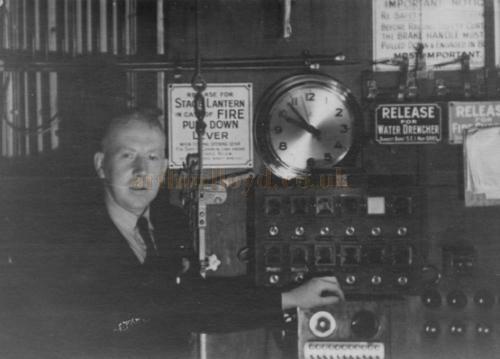 In 1930 Ted became stage manager and maintenance man, and shortly before the Theatre was transformed into the Queen's at a cost of £71,800 by the Cinema Chain owner James Brennan, he became general manager of the Theatre. 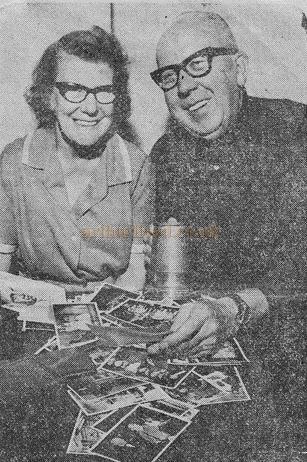 Left - Ted Foreshaw and his wife, the former Mrs. Edwards in a photograph from a newspaper clipping - Courtesy Dawn Hughes, whose grandmother Mrs. Edwards' second husband was Ted Foreshaw. 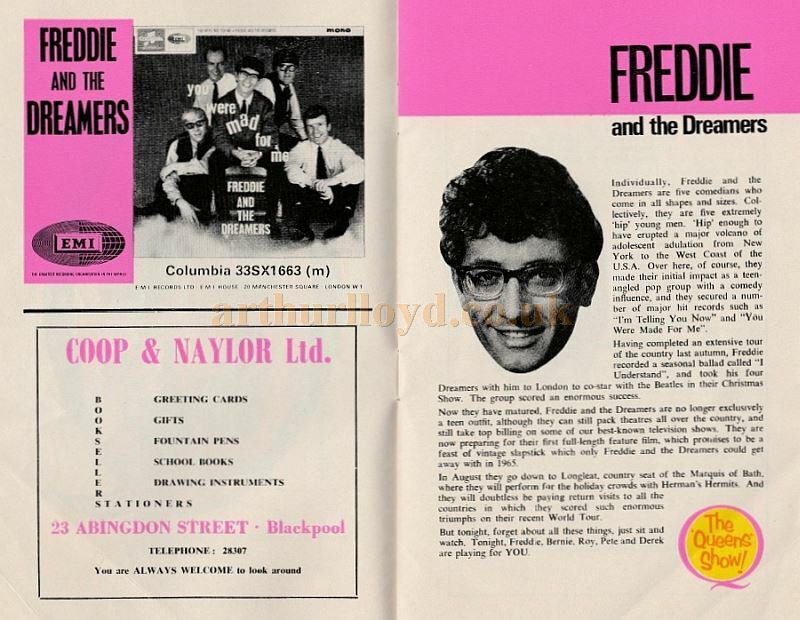 Right - A Programme for 'Aladdin' at the Queen's Theatre, Blackpool - Courtesy Roy Cross. 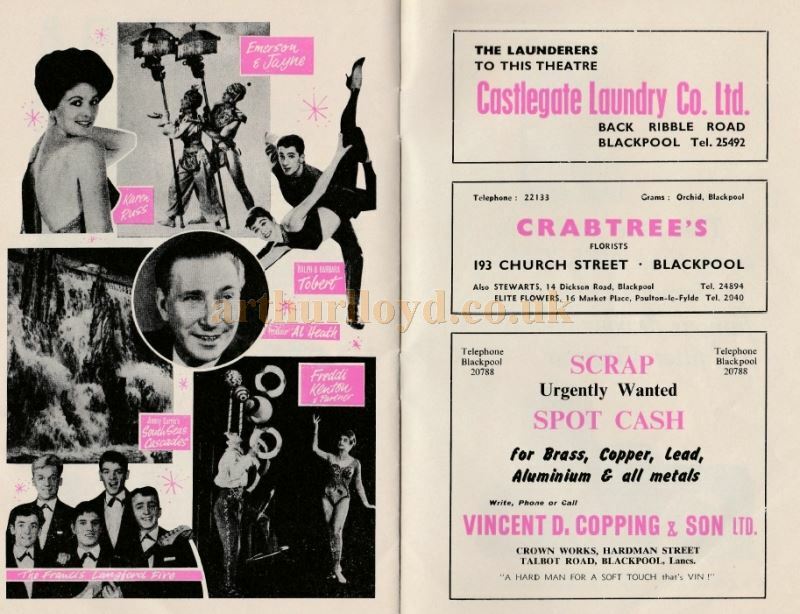 The production commenced on Thursday the 24th of December 1953 and in the cast were Hylda Baker, Alex Munro, Tommy Wills, Maggie Fitzgibbon, Jon Boden, Ann Valerie, Pat O'Brian, Maureen Rose, Doris Davis, John Lowe, and the Campbell & Rogerson Sopwith Wood Girls and Kiddies. 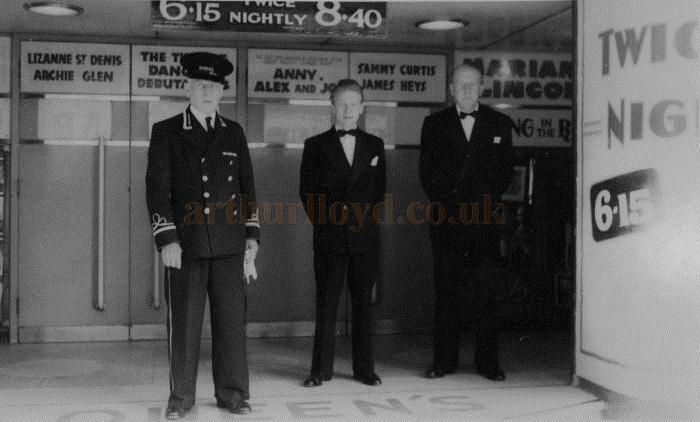 Above - Ted Foreshaw and two of his colleagues standing in the foyer of the Queen's Theatre, Blackpool - Courtesy Dawn Hughes whose grandmother, Mrs. Edwards' second husband was Ted Foreshaw. Jimmy died in the early sixties when times were changing and holiday makers starting to go abroad for their holidays. Control of the Theatres and Cinemas passed to a brother who was not really interested in them and he sold them off one by one. 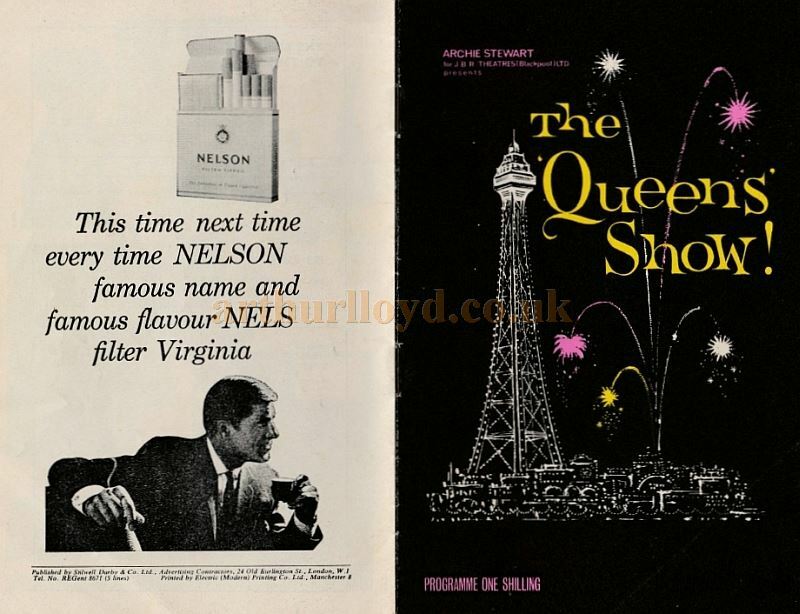 The Queen's was then demolished. 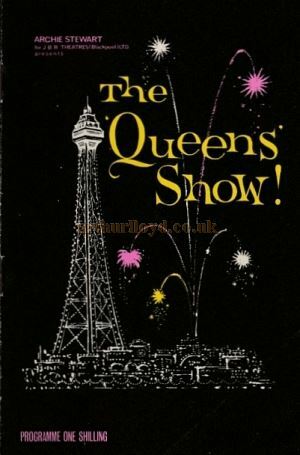 Parts of this article on The Borough Theatre / Feldman's / Queen's Theatre were written by Donald Auty and are from his larger piece on Blackpool's Theatres, written for the site by him in 2003. 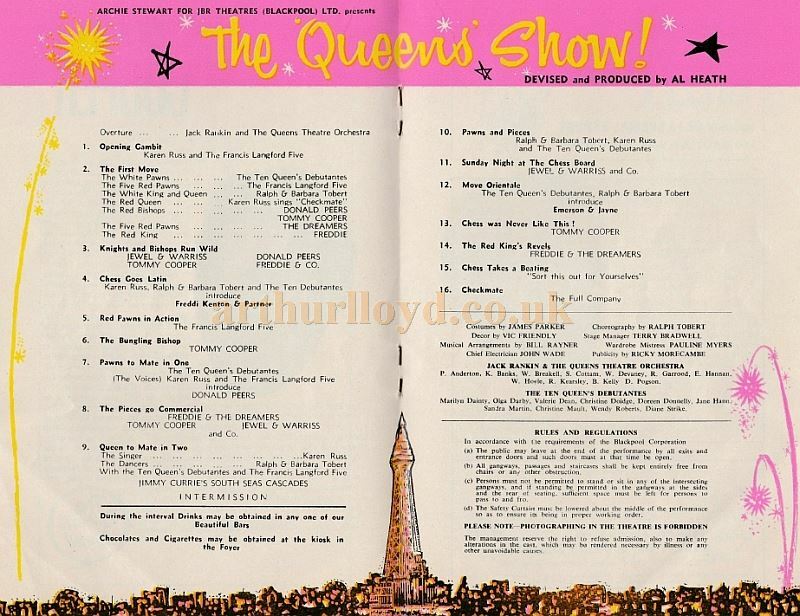 Other details are by myself M. L.
Above - A Programme for 'The Queen's Show' at the Queen's Theatre, Blackpool in 1965 - Courtesy Jeff Barron.